We used the 10 PCR samples from last week (Experiment 3: Large Quantity PCR) and purified them using GeneJET PCR Purification Kit. We proceeded by digesting the purified products with XBA1 and PST1. This will prepare our gene segment with the properly cut biobrick ends to be inserted into our vector plasmid. After the digestion, we purified the products to clean them of the enzymes and contaminants. We are currently running gel electrophoresis to check if we have viable DNA segments. The samples we are testing are as follows: raw PCR product from experiment 3 (T1), purified PCR product (T2), purified digested PCR product (T3), and the negative/positive controls from experiment 3 (+/-). We expect to see from: T1- Our PCR experiment worked correctly with our primers and still have the correct length of DNA (1044 bp plus biobricks). T2- How well the GeneJET kit worked in purifying our gene. T3- If our gene was properly digested with XBA1 and PST1 (it'll show as a slightly smaller band, ~10 bp shorter). +/- controls- Should be consistent with the gel results from experiment 1. 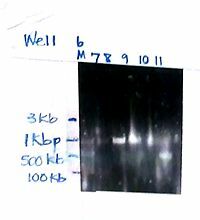 Well 6: 100bp DNA Plus Ladder, Well 7: T1, Well 8: T2, Well 9: T3, Well 10: negative control, and Well 11: positive control. Our results were as expected as discussed above, but our gel was contaminated with either undissolved agarose or something unknown on the plate. This is the reason for the specks/streaks that are visible in wells 9 and 10. If you look past the contaminants, we did get good results at the right band size (about 1000bp). We can conclude that our DNA is properly digested and ready for ligation once we transform/digest our plasmids.